Christians from around the world have gathered in Brisbane, Australia, this week to shine a light on corruption through various awareness raising events around the G20 summit. The World Evangelical Alliance said that with dozens of Christian organizations it has joined together in the two-year EXPOSED campaign that culminates this week. "We, the leaders of faith based communities, issue this letter calling for integrity and transparency in public life," the letter says. Groups in EXPOSED include the WEA, the World Council of Churches, the Bible Society, Micah Challenge and The Salvation Army. Leaders from the world's leading economies have gathered in the Australian city of Brisbane, to launch the G20 summit and news agencies report the crisis in Ukraine expected to take center-stage. The two-day summit began November 15 and may be a showdown between Western leaders and Russian President Vladimir Putin due to fresh reports of Russian troops and equipment pouring into eastern Ukraine. 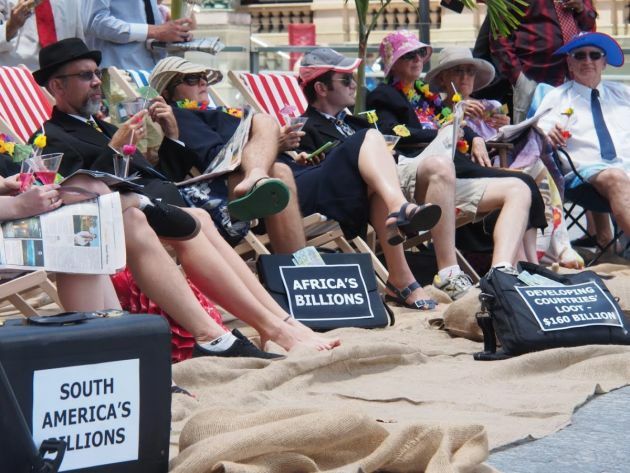 EXPOSED is as an open letter from Christian leaders along with tens of thousands of signatures handed to G20 leaders, asking them to take action against tax evasion and other forms of corruption. "Caring for the poor is a core Biblical mandate and many organizations and countless individuals in our Christian family are devoted to fighting poverty and the adverse effects it has on people," said Dr. Geoff Tunnicliffe, secretary general of the WEA. "However, corruption effectively prevents the poor from being freed from their plight and is therefore a priority issue that needs to be highlighted and addressed." Over the last two years, Christians in every region of the world have held worship services, prayer vigils, met with local and national politicians and organized other activities to raise awareness about the wide-spread problem of corruption. Corruption is arguably the key obstacle to ending extreme poverty. They have come together to shine a light on all forms of illicit practices globally and in their neighborhoods. These include nepotism, bribery, cheating, money-laundering, discrimination, extortion, prejudice, collusion, secrecy, favoritism, and tax evasion. WEA said conservative estimates are that tax evasion alone takes some $160 billion away from developing nations each year - more than the $128 billion that they receive in foreign aid. The EXPOSED campaign is addressing G20 leaders, because this is the forum of the 20 economically most powerful nations. It says they are well-positioned to create policies demanding more transparency in businesses and governments. "Such policy changes could make it more difficult for multinational corporations to transfer their profits to nations overseas where they pay less tax," says WEA. This is "instead of declaring their profits in the country where it was actually earned and where it could be used to improve health care, education, and other public services: all needed to effectively improve the lives of the poor." The EXPOSED open letter (from Christian leaders) calls for "integrity and transparency in public life" and asks the G20 to fulfil their mandate by formulating policies that will "restore fairness and prevent greed." "Many of our 7 regional and 129 national Evangelical Alliances and other members and partners have been actively involved in the EXPOSED campaign over the last two years," Tunnicliffe said. "As we follow the conversations at the G20 this weekend and watch for the results of the campaign on a global level, let us continue to shine a light and expose corruption in our own neighborhoods and contexts."